Activate 1 & 2 Separation: Makes pulling become tickling when used on another creature. Includes updated pushing and pulling scripts that work on all creatures. Bacteria Revamp-Dish: Replaces DS bacteria with bacteria that will prosper in certain conditions not based on metaroom but based on CAs. Comes with a sprite file with new shapes for bacteria. Bacteria Options: Allows you to change Bacteria Revamp-Dish bacteria to be helpful, harmful, a mix, or harmless. Also allows you to change minimum, maximum, and visibility. Comes with a nifty reset button. Bacteria Checker: Shows its current room's conditions for bacteria from Bacteria Revamp-Dish. Detritus Smell: Uses the smell of flowers and turns it into the smell of Detritus instead. Sensorimotor Input & Lobe: Adds a new input agent that will send outputs to a new lobe you can add to creature breeds. Allows for many new things to be sensed. 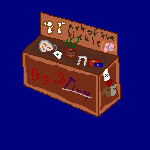 Tiny Auto-vendors: Small auto-vendors that spawn with 4 varieties, and can be duplicated or deleted with shift clicking and control clicking. 1.03: Fixed a bug where healthy only bacteria couldn't get the "toxin" dehydronase. Added alternative files that change ATP decoupler and Cynide to Alcohol, and Medicine One and Sodium Thiosulphite into Dehydronase. There is a random norn with the lobe in the download, but having a lobe with tissue id 15 with no updates and initialization not always running with all the rules for both updates and initialization being stop, with a total lobe size of 64 neurons. The agent should then be able to communicate with the lobe. Are there instructions for adding the sensorimotor lobe anywhere?